Taishakukyo is the best spot to visit in Northern Hiroshima in autumn consists of the 18 Km long Taishakukyo River basin, and Shinryu Lake. 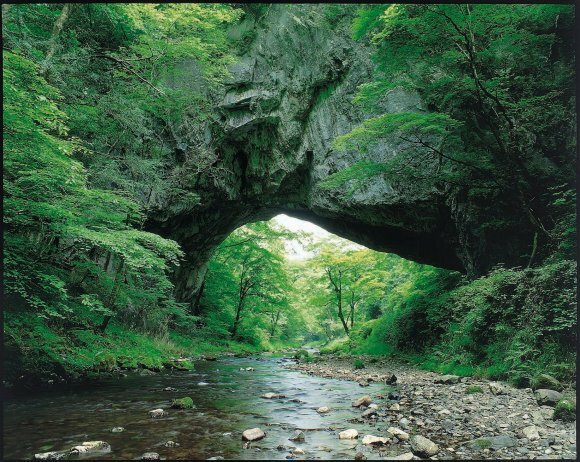 There are several spots you can visit in a one go such as Hiba-Dogo-Taishaku Quasi-National Park, Taishakuten Eimyo-ji Temple, Shinryu Lake. Most recommended part is The Yosekura-Iwakage Ruins, where excavations have turned up samples dating back thousands of years. Hakuun-do Cave, a 200-meter-long limestone cave. Pleasure boat that takes visitors on a scenic forty minute tour of Shinryu Lake. While on the boat, you can admire the beautiful sight of the nearby mountains. Taishakukyo Gorge is part of the Hiba-Dogo-Taishaku Quasi-National Park, which covers an area of nearly 80 square kilometers, and spans Hiroshima, Tottori, and Shimane prefectures. Taishakuten Eimyo-ji Temple, which was established in 709. The surrounding area is actually named after the Buddhist deity said to be enshrined there, Taisakuten, a guardian of Buddhism and its teachings. While tourists are generally not allowed inside the main hall, the building is a wonderful sight. You can also enjoy trekking, kayaking like other activities there. Forecast autumn viewing time is from the latter part of October to the beginning of November.